Home » Hair Fibers » Hair Cubed » Hair Cubed® Review – Does Hair Cubed Really Work? Get Hairloss Solution? Details Here! Hair Cubed® Review – Does Hair Cubed Really Work? Get Hairloss Solution? Details Here! Hair loss and thinning are two hair problems that are commonly mentioned together. In an effort to see the product that will best suit us, I stumbled over the Hair Cubed® brand. The former occurs when an individual looses more than the normal number of hair daily while the later sets in when the hair significantly looses thickness. For a fact, a good number of folks affected by hair loss and thinning hair have desperately searched for and resorted to the use of different products or programs most of which achieved little or no result. Hair Cubed claims to address thinning hair and any type of hair loss in affected folks. Are there clear proofs that this product really does what it claims or is it another scam? We are here to evaluate this and others in line with the product’s information. 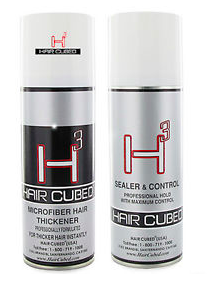 What is Hair Cubed® ? 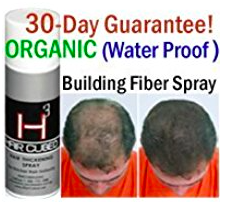 Hair Cubed® is marketed as a concoction of organic micro spray fibers designed to help folks experiencing hair loss and thinning hair. It is said to be a hair building fiber and according to the manufacturer, it should give the hair a thicker, fuller and a completely natural look. The maker of Hair Cubed shares that it is compatible and can be used with other hair loss medications and styling products. It is said to be ideal for all hair types and should be water, rain, wind, and perspiration proof. This is to say that this hair building fiber formula stays long in the hair until it is washed out with shampoo. This product is available in eleven (11) shades and each bottle should last for 2-5 months. The hair can be styled as desired when it is dry. 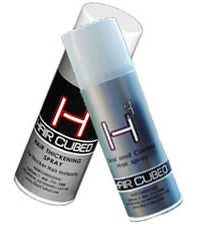 Hair Cubed is said to contain micro fibers in spray form. From the product’s information, I discovered that its constituents are organic, which they mention that they do not impede new hair growth. From the product label, I could find a list of these organic constituents except minoxidil. Hence, it is not one of those minoxidil based hair products on the market out there! How Does Hair Cubed® Work? Hair Cubed is said to thicken the hair and makes it fuller by sticking to the natural hair (the microfibers) and blending with it. According to the manufacturer, it usually stays fastened to the hair without falling out even when it comes in contact with water or sweat. Hair Cubed should be gently sprayed as previously noted and the hair should be brushed for at least 30 seconds. It should be safe when combined with other hair loss medications and hair styling products. According to the details I found, Hair Cubed claims that it’s effective in both men and women who are experiencing hair loss and thinning hair. In line with the product’s details by the manufacturer, it can be used in all types of hair loss and thinning hair. Plus the company sells different color hair formulas, such as Black, Brown, Medium Brown, etc. Similarly, individuals who are using other hair treatment products can also use Hair Cubed®. It is not for use in individuals whose case demands the diagnosis, treatment, prevention or cure of a disease. 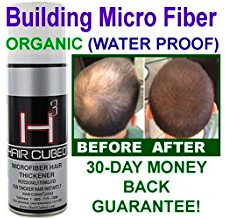 Hair Cubed manufacturer seems to back up this product with 30 days no question asked refund. This will give enough time for us to test the product and make a refund demand if it does not achieve what it claims. According to the product maker, ordered items are shipped discretely in that no mark will be given on the product’s package as to its content. This protects users’ privacy. It promotes to work effectively. It is said to be compatible with other products and promotes that it does not contain any harsh chemical. The manufacturer offers automatic shipment plan (a monthly supply of Hair Cubed® formula which is available for customers paying with credit cards). For inquiries and other complaints, there are channels on the product’s official website through which we can contact the manufacturer. It is also on other retail websites as well ! Do Hair Cubed details validate the claim that it is the world’s #1 hair treatment product recommended by many hair transplant clinical surgeons? Hair Cubed label shows that it contains organic ingredients devoid of harmful prescription hair treatment substances. In the manufacturer’s primary website, I found positive reviews by doctors and other users. A good number of them also exist in some retail websites where the product is sold. Also, the manufacturer’s way of protecting buyers’ privacy and offer of a refund is commendable. At this juncture, I will say that Hair Cubed hair building micro fiber solution could be worth checking out if that’s the road you choose. We can get it in the product’s official website or on Amazon. However, a guy like me would rather a proven to be effective and safe hair growth solution that will actually make my hair regrow all over again in a real, natural way. Profollica is what I choose here in my opinion. 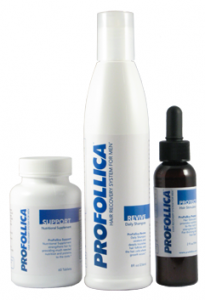 If you want to find out more, you can head out to my review of the Profollica hairloss solution. Don’t leave before leaving a single comment underneath this review! It’s my please to hear from you. Previous Post Grow Gorgeous Hair Products Review – Do They Really Work As Claimed? Find Out Here! Next Post Capillus 202 Review – Any Hair Restoration Benefit? Does Cost More for 202 Laser Diodes!